nigeria and the Ogonis had brought to the world's attention one outrage; the remote province of Irian Jaya in Indonesia is highlighting another. Replace Royal Dutch Shell ( Down To Earth , Vol 4, No 14) with Freeport Indonesia, and the elements of the drama remain the same: a long corporate track record of environmental misdemeanour, outraged tribals who demand adequate compensation and equity and an oppressive military regime that colludes with the corporation in cracking down on opponents. Amidst this maelstrom of controversy, Freeport Indonesia, the Indonesian unit of the us mining company Freeport McMoran Copper and Gold Inc (based in New Orleans), seems to have pulled out all the stops to clear itself of the numerous charges levelled at it. In April, three developments occurred that bucked up the company. 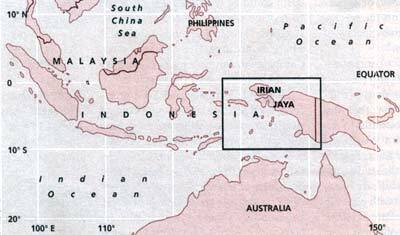 James Moffet, the head of Freeport McMoran, pledged to pay one per cent of the company's income to the local population of Irian Jaya, which would work out to around us $17.6 million a year. Then in late April, the company received some good news from two fronts: first, the us Overseas Private Investment Corporation (opic), which had withdrawn insurance cover last year from the company on the grounds that the waste from the mine was degrading rainforests in the region, agreed to reinstate the us $100 million insurance cover till the end of this year. Another breather was provided by an audit conducted by Dame & Moore, the American environmental consultancy agency at the behest of Freeport which had been, in turn, prodded by the Indonesian authorities. The report concluded that Freeport Indonesia had made considerable efforts towards improving environmental management at its Grasberg mine in Irian Jaya. "We are confident that this report will correct a lot of the misinformation," said a confident Paul Murphy, Freeport Indonesia's executive vice president. Misinformation? But the company has not got off the hook. The auditors also note that until recently, when the exploitation of the Grasberg deposits started, Freeport Indonesia was "slow to meet its environmental challenges, adopting a reactive rather than proactive response". At the heart of the criticisms levelled at the company is the disposal of tailings from the mine into rivers -- "the most visible, unsightly and critical issue". Though the company insists that the tailings are non-toxic, it has long been under fire from tribals who live in the villages around Tembagapura, a town close to Grasberg. They allege that Freeport, one of the world's largest copper, gold and silver mining operations, has caused widespread damage to the rainforests by dumping thousands of tonnes of mining waste into the rivers everyday. Environmentalists in Indonesia and the us have added their voice to that of the tribals. Their view is that the company has done very little to contain tailings below the mine site and that the run-off from the tailings has killed fish in nearby rivers. They also allege that the water from the rivers has become unpotable. opic had withdrawn the insurance policy it held on the mine for similar reasons. According to the firm, tailings below the mine had "severely degraded the rainforests surrounding the Ajkwa and Minajerwi rivers" and had "created and continues to pose unreasonable or major environmental, health or safety hazards with respect to the rivers that are being impacted by the tailings, the surrounding terrestrial ecosystem and the local inhabitants." However, Freeport Indonesia, notes the environmental auditor's report approvingly, has taken measures to deal with such criticisms. The auditors dub Freeport's plan to develop a tailings storage area using levees as an "acceptable solution". The levees project will cost the company us $25 million in capital expenditure and a further us $12 million a year to maintain. The auditor's team has made a total of 33 recommendations to the company, which include a study of potential liabilities from neglect of waste management in the past and greater commitment to study the region's fauna and flora of which Freeport has adopted 24. But as Shell discovered in Nigeria and Freeport now finds in Irian Jaya, the tide of popular resentment against the company is so strong that belated -- and possibly token -- gestures are unlikely to help. A powerful challenge has already been thrown by separatists of the Organisasi Papua Merdeka (opm, or the Free Papua Movement), a long time opponent of the mining project. The opm contends that Freeport, in conjunction with the Indonesian government, has compelled the locals to leave their ancestral lands without compensation. It also harbours other grudges against Freeport, such as its environmental destructiveness and its collusion with the Indonesian government which conducts military raids against Papuans. To focus attention on their grievances, the opm kidnapped 24 persons on January 8 this year. Ironically, the hostages were all more likely to share the opm 's environmental concerns: four were Cambridge students who had come to study the region's flora, one was a World Wide Fund for Nature representative and another was an unesco official on leave from Jakarta. Though tribal sentiments may be assuaged somewhat by Freeport's decision to pay one per cent of its income to the local population of Irian Jaya, Moffet has not specified how or when the one per cent will be handed over. In the meantime, Freeport's unsavoury past record continues to haunt it. Says an angry Kelly Kwalik, the leader of opm, in an interview to Asiaweek : "If someone comes into your garden and steals your pig without offering any compensation, then you have a right to kill them. That is tribal law." Kwalik's other grievance is that Freeport has provided employment to less than 10 per cent of the local population and that too in menial jobs. Another cause for complaint is that the Freeport mines contribute 20 per cent of Indonesia's gross national product, but Irian Jaya receives less than one per cent of the national budget for health care and education. The opm is not the only group ranged against the Freeport mine which contains an estimated 38 billion pounds of copper, 47.6 million ounces of gold and 108.5 million ounces of silver -- together valued at us $60 billion. Also bitter at being denied a slice of the cake (last year the mine produced us $1.6 billion worth of ore) are the indigenous people such as the Amungme and Dani tribes which lived near the mine for thousands of years, but have now been largely displaced by the Freeport project. Freeport also has to clear itself of charges that it has been hand-in-glove with the military government in staving off challenges through human rights abuses. On April 5 last year, the Australian Council for Overseas Aid (acfoa) released a damning report which alleged that 37 people from a village near Mapanduma, where the mine is located, had been killed or had disappeared between June 1994 and February 1995. The acfoa report also alleged that Freeport security personnel were behind some of the murders -- a charge which the company strongly denies. Human rights violations have also come to the fore in the reports of the Catholic Church of Jayapura and the Indonesian Human Rights Commission. Though these two organisations do not implicate Freeport, they have pointed to numerous instances of torture and murder of local people by the Indonesian military, including one particular murder that occurred aboard a Freeport bus and torture that took place at a Freeport security post. Freeport's critics refuse to believe that the company is clean. "Freeport shares a moral responsibility for the recent tragic events since the military is protecting Freeport operations," say a dozen us-based environmental groups such as Environmental Defense Fund, Sierra Club and International Rivers Network in a letter to the company. Other critics too refuse to buy the argument that Freeport is a helpless bystander as the military indulges in blatantly oppressive acts against the local population. The truth of the matter, they point out, is that the two sides benefit from scratching each other's back. President Suharto's government holds a nine per cent stake in the mine, while taxes and royalties from the mine provide it with us $250 million a year. The mine is the country's largest source of tax revenue. On the other hand, maintains Steve Feld, a member of the American Academy of Sciences and a long standing critic of Freeport, the company provides food, shelter and transportation to Indonesian troops which guard the mine. "Military rule works great for corporations," says Feld. "They know who is in charge and they know who they have to please and they know who they can count on to take care of business. Freeport can hardly expect us to be sympathetic when they say the Indonesian army is not our problem and we are not involved." That the two sides work in a cosy partnership was apparent in March when 500 soldiers cracked down on rioters in Timika who were enraged by an accident in which a local was injured by a Freeport vehicle. In the course of the riots, tribespeople armed with stones and arrows attacked the mining company's facilities claiming, "We are fighting against Freeport and the government... because our rights are not recognised, our resources are extracted and destroyed while our lives are taken." The riots forced the closure of Freeport's mine in Tembagapura, 3,000 km east of Jakarta, for two-and-a-half days. In the wake of the riots, Freeport McMoran made the announcement that it would set aside one per cent of its annual revenue to help the local people. Chairperson Moffet also told the locals that he would undertake a study of the demands they had submitted related to pollution and jobs. For now, Moffet is upbeat. "We are thrusting a spear of economic development into the heart of Irian Jaya," he says. If only he could sell this argument to the angry locals!